Obama, Castro Sit For Historic Meeting At Americas Summit : The Two-Way The two leaders met on the sidelines of the gathering in Panama City. It was the first substantive meeting between leaders of the U.S. and Cuba in more than five decades. President Obama and Cuban President Raul Castro today moved an important step closer to normalizing relations between their nations after decades of Cold War rival animosity, sitting down for the first substantive meeting in more than 50 years between leaders of the two countries. 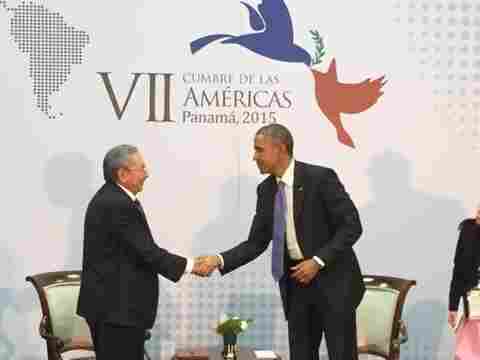 Obama and Castro shook hands and exchanged pleasantries for a second time at the Summit of the Americas being held in Panama City. "[Obviously] there are still going to be deep and significant differences between our two governments," Obama acknowledged even as he welcomed "the spirit of openness and courtesy" Castro had shown during their talk. "We will continue to try to lift up concerns around democracy and human rights," he said. "[Some] of our immediate tasks include normalizing diplomatic relations and ultimately opening an embassy in Havana, and Cuba being able to open an embassy in Washington, D.C. so that our diplomats are able to interact on a more regular basis," Obama added. Speaking through an interpreter, Castro, the brother of long-time Cuban president and communist revolutionary Fidel Castro who assumed the presidency in 2008, said: "I think that what President Obama has just said, it's practically the same as we feel about the topics, including human rights, freedom of the press." "I think everything can be on the table," he said. Obama and Castro also shook hands and spoke briefly during the opening ceremony at the summit, an event that includes Cuba for the first time. Earlier, The Associated Press wrote: "Anticipation of an Obama-Castro meeting has been steadily building throughout this week's Summit of the Americas in Panama City, and reached a fever pitch Friday evening when they traded handshakes and cordial greetings in a prelude of things to come. Not once in more than 50 years have the leaders of Cuba and its northerly neighbor spent quality time together, assuring their expected sit-down on Saturday would be one for the history books." On Friday, Obama said that "strong nations don't fear active citizens; strong nations embrace and support and empower active citizens." "As we move toward the process of normalization, we'll have our differences government-to-government with Cuba on many issues, just as we differ at times with other nations within the Americas, just as we differ with our closest allies. There's nothing wrong with that," he Obama. Reuters notes that: "Earlier on Friday, Obama met with opposition activists from across Latin America, including two Cubans, but there was very little media access to the session, curbing publicity of an encounter that could have annoyed Castro's communist government."